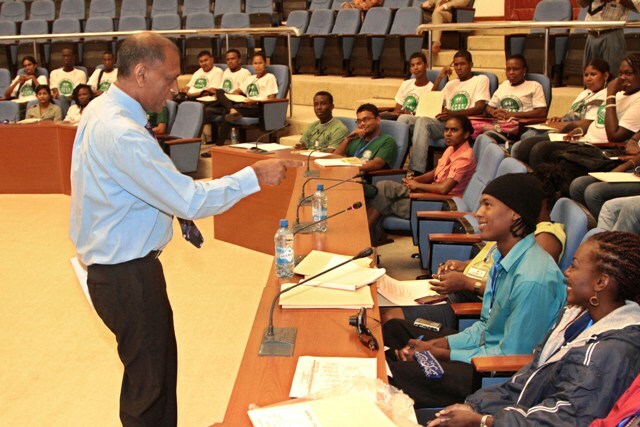 Agriculture Minister, Dr. Leslie Ramsammy addresses a youth workshop at the Caribbean Week of Agriculture (CWA). [www.inewsguyana.com] – Agriculture Minister Dr. Leslie Ramsammy says Guyana is retooling its agriculture curricula to include entrepreneurship as a necessary component. He made the remark on Tuesday, October 8 at a youth workshop at the Caribbean Week of Agriculture (CWA) being hosted at the Guyana International Conference Centre. The Minister in his usual passionate manner decried negative perceptions of agriculture saying that it must be treated like all other entrepreneurial pursuit. He even rejected the label of “agri-preneurs” used by his Permanent Secretary earlier saying it contributed to the poor perception of the sector. “Young people, you and I must say no, we ain’t want them to put us always in a separate corner, entrepreneurship is about business and agriculture is the biggest business in the world,” he declared to applause. In addition to perception Dr. Ramsammy said there was also need for policy changes within agriculture that would facilitate it getting to where it needs to be. The Minister added that his ministry is designing a programme with 100 one-acre plots at Mon Repos which will see students form teams to develop an enterprise with their lots. “It will be a money-generating enterprise that in addition to learning agriculture you will practice agriculture from the entrepreneurial side. By the time you leave GSA you would not only have your diploma but you would have had practical experience in developing and implementing a business enterprise,” Dr. Ramsammy said. The new component, he added, would be a requirement for graduation. The University of Guyana would also be brought on board. The students would also be involved in a project in Region Nine to add value and market a cassava crop Dr. Ramsammy said. Another one will see students work with residents to grow and package rice in the same region. According to the Minister, students will also be assigned to Region One to solve the transportation and distribution problems faced by turmeric farmers there. Dr. Ramsammy also announced that five students from St. Vincent and the Grenadines would be joining the GSA this week while another five from Barbados would do so subsequently.